Posted by TheChamp on Sep 12th, 2009 and filed under Champions. You can follow any responses to this entry through the RSS 2.0. Both comments and pings are currently closed. Usain St. Leo Bolt, C.D. (pronounced /ju? ?se?n/;born 21 August 1986), is a Jamaican sprinter and a three-time Olympic gold medalist. He holds the world record for the 100 metres, the 200 metres and, along with his teammates, the 4×100 metres relay. He also holds the Olympic record for all three of these races. At the 2008 Summer Olympics, Bolt became the first man to win three sprinting events at a single Olympics since Carl Lewis in 1984, and the first man to set world records in all three at a single Olympics. In 2009 he became the first man to hold the 100 and 200 m world and Olympic titles at the same time. Bolt distinguished himself with a 200 m gold medal at the 2002 World Junior Championships, making him the competition’s youngest-ever gold medalist. In 2004, at the CARIFTA Games, he became the first junior sprinter to run the 200 m in under 20 seconds with a time of 19.93 s, breaking Roy Martin’s world junior record by two-tenths of a second. He turned professional in 2004, missing most of his first two seasons due to injuries, but he competed at the 2004 Summer Olympics. In 2007, he beat Don Quarrie’s 200 m Jamaican national record with a run of 19.75 s. In May 2008, Bolt set his first 100 m world record with a time of 9.72 s. He set world records in both 100 m and 200 m events at the 2008 Beijing Summer Olympics: 100 m record time of 9.69 s broke his own previous record of 9.72 s; with a record time of 19.30 s he broke previous record of 19.32 s by Michael Johnson at the 1996 Summer Olympics in Atlanta. In August 2009, a year after the Beijing Olympics, he lowered his own 100 m and 200 m world records to 9.58 s and 19.19 s respectively at the 2009 World Championships.His record breaking margin in 100 m is the highest since the start of digital time measurements. As a result of Bolt’s successes in athletics, he was named the Laureus World Sportsman of the Year for 2009.His achievements in sprinting have earned him the media nickname “‘Lightning Bolt”. Bolt was born on 21 August 1986 in Sherwood Content, a small town in Trelawny, Jamaica, and grew up with his parents, Jennifer and Wellesley Bolt, his brother Sadeeki, and his sister Sherine. His parents ran the local grocery store in the rural area, and Bolt spent his time playing cricket and football in the street with his brother, later saying, “When I was young, I didn’t really think about anything other than sports”. As a child, he attended Waldensia Primary and All-age School, and it was here that he first began to show his sprinting potential, running in the annual national primary-schools’ meeting for his parish. By the age of twelve, Bolt had become the school’s fastest runner over the 100 metres distance. Upon his entry to William Knibb Memorial High School, Bolt continued to focus on other sports, but his cricket coach noticed Bolt’s speed on the pitch and urged him to try track and field events. Pablo McNeil, a former 100 metres Olympic athlete, and Dwayne Barrett coached Bolt, encouraging him to focus his energy on improving his athletic abilities. The school had a history of athletic success with past students, including sprinter Michael Green. Bolt won his first annual high school championships medal in 2001, taking the silver medal in the 200 metres with a time of 22.04 seconds. McNeil soon became his primary coach, and the two enjoyed a positive partnership, although McNeil was occasionally frustrated by Bolt’s lack of dedication to his training and his predisposition to practical jokes. Performing for Jamaica in his first Caribbean regional event, Bolt clocked a personal best of 48.28 s in the 400 metres in the 2001 CARIFTA Games, winning a silver medal. The 200 m also yielded a silver as Bolt finished in 21.81 s.
Former Prime Minister P. J. Patterson recognised Bolt’s talent and arranged for him to move to Kingston, along with Jermaine Gonzales, so he could train with the Jamaica Amateur Athletic Association (JAAA) at the University of Technology, Jamaica. The 2002 World Junior Championships before a home crowd in Kingston, Jamaica, gave Bolt a chance to prove his credentials on the world stage. By the age of 15, he had grown to 1.96 metres (6 ft 5 in) tall, and he physically stood out amongst his peers. He won the 200 m, in a time of 20.61 s, a new personal best. As a member of the Jamaican sprint relay team, Bolt took two silver medals and set national junior records in the 4×100 metres and 4×400 metres relay with times of 39.15 s and 3:04.06 minutes, respectively. Bolt’s 200 m win made him the youngest world-junior gold medalist ever. The flow of medals continued as he won another gold at the 2003 World Youth Championships. He set a new championship record in the 200 m with a time of 20.40 s, despite a 1.1 m/s head wind. Michael Johnson, the 200 m world-record holder, took note of Bolt’s potential but worried that the young sprinter might be over-pressured, stating, “It’s all about what he does three, four, five years down the line”. Bolt had also impressed the athletics hierarchy, and he received the IAAF Rising Star Award for 2002. Bolt turned his main focus to the 200 m and equalled Roy Martin’s world junior record of 20.13 s at the Pan-American Junior Championships. This performance attracted interest from the press, and his times in the 200 m and 400 m led to him being touted as a possible successor to Johnson. Indeed, at sixteen years old, Bolt had reached times that Johnson did not register until he was twenty, and Bolt’s 200 m time was superior to Maurice Greene’s season’s best that year. In his final Jamaican High School Championships in 2003, he broke both the 200 m and 400 m records with times of 20.25 s and 45.30 s, respectively. Bolt’s runs were a significant improvement upon the previous records, beating the 200 m best by more than half a second and the 400 m record by almost a second. Bolt was growing more popular in his homeland. Howard Hamilton, who was given the task of Public Defender by the government, urged the JAAA to nurture him and prevent burnout, calling Bolt “the most phenomenal sprinter ever produced by this island”. His popularity and the attractions of the capital city were beginning to be a burden to the young sprinter. Bolt was increasingly unfocused on his athletic career and preferred to eat fast food, play basketball, and party in Kingston’s club scene. In the absence of a disciplined lifestyle, he became ever-more reliant on his natural ability to beat his competitors on the track. As the reigning 200 m champion at both the World Youth and World Junior championships, Bolt hoped to take a clean sweep of the world 200 m championships in the Senior World Championships in Paris. Bolt beat all comers at the 200 m in the World Championship trials, but he was pragmatic about his chances and noted that, even if he did not make the final, he would consider setting a personal best a success. However, he suffered a bout of conjunctivitis before the event, and it ruined his training schedule. Realising he would not be in peak condition, the JAAA refused to let him participate in the finals on the grounds that he was too young and inexperienced. Bolt was dismayed at missing out on the opportunity, but focused on getting himself in shape to gain a place on the Jamaican Olympic team instead. Even though he missed the World Championships, Bolt was awarded the IAAF Rising Star Award for the 2003 season on the strength of his junior record-equalling run. Under the guidance of new coach Fitz Coleman, Bolt turned professional in 2004, beginning with the CARIFTA Games in Bermuda. He became the first junior sprinter to run the 200 m in under twenty seconds, breaking Roy Martin’s world junior record by two tenths of a second with 19.93 s. A hamstring injury in May ruined Bolt’s chances of competing in the 2004 World Junior Championships, but he was still chosen for the Jamaican Olympic squad. Bolt headed to the 2004 Athens Olympics with confidence and a new record on his side. However, he was hampered by a leg injury and was eliminated in the first round of the 200 metres with a disappointing time of 21.05 s. American colleges offered Bolt track scholarships on the strength of his performances, but the teenager from Trelawny refused them all, stating that he was content to stay in his homeland of Jamaica. Bolt instead chose the surroundings of the University of Technology, Jamaica, as his professional training ground, staying with the university’s primitive track and weight room that had served him well in his amateur years. The year 2005 signalled a fresh start for Bolt in the form of a new coach, Glen Mills, and a new attitude to athletics. Mills recognised Bolt’s potential and aimed to cease the sprinter’s unprofessional approach to the sport. Bolt began training with Mills in preparation for the upcoming athletics season, partnering with more-seasoned sprinters such as Kim Collins and Dwain Chambers. The year began well, and in July he knocked more than a third of a second off the 200 m CAC Championship record with a run of 20.03 s, then registered his 200 m season’s best at London’s Crystal Palace, running in 19.99 s. Misfortune awaited Bolt at the next major event, the 2005 World Championships in Helsinki. Bolt felt that both his work ethic and athleticism had much improved since the 2004 Olympics, and he saw the World Championships as a way to live up to expectations, stating, “I really want to make up for what happened in Athens. Hopefully, everything will fall into place”. Bolt qualified with runs under 21 s, but he suffered an injury in the final, finishing in last place with a time of 26.27 s. Injuries were preventing him from completing a full professional athletics season, and the eighteen-year-old Bolt still had not proven his mettle in the major world-athletics competitions. Bolt was involved in a car accident in November, and although he suffered only minor facial lacerations, his training schedule was further upset. His manager, Norman Peart, made Bolt’s training less intensive, and he had fully recuperated the following week. Bolt had continued to improve his performances, and he reached the world top-5 rankings in 2005 and 2006. Peart and Mills stated their intentions to push Bolt to do longer sprinting distances with the aim of making the 400 m event his primary event by 2007 or 2008. Bolt was less enthusiastic, and demanded that he feel comfortable in his sprinting. He suffered another hamstring injury in March 2006, forcing him to withdraw from the 2006 Commonwealth Games in Melbourne, and he did not return to track events until May. After his recovery, Bolt was given new training exercises to improve flexibility, and the plans to move him up to the 400 m event were put on hold. Upon his return to competition, the 200 m remained his primary event, and he beat Justin Gatlin’s meet record in Ostrava, Czech Republic. Bolt had aspired to run under twenty seconds to claim a season’s best but, despite the fact that bad weather had impaired his run, he was happy to end the meeting with just the victory. However, a sub-20-second finish was soon his, as he set a new personal best of 19.88 s at the 2006 Athletissima Grand Prix in Lausanne, Switzerland, finishing behind Xavier Carter and Tyson Gay to earn a bronze medal. Bolt had focused his athletics aims, stating that 2006 was a year to gain experience. Also, he was more keen on competing over longer distances, setting his sights on running regularly in both 200 m and 400 m events within the next two years. Bolt claimed his first major world medal two months later at the IAAF World Athletics Final in Stuttgart, Germany. He passed the finishing post with a time of 20.10 s, gaining a bronze medal in the process. The IAAF World Cup in Athens, Greece, yielded Bolt’s first senior international silver medal. Wallace Spearmon from the United States won gold with a championship record time of 19.87 s, beating Bolt’s respectable time of 19.96 s. Further 200 m honours on both the regional and international stages awaited Bolt in 2007. The young Jamaican yearned to run in the 100 metres, but coach Mills diverted his attention, stating that he could run the shorter distance if he broke the 200 m national record. In the Jamaican Championships, he ran 19.75 s in the 200 m, breaking the 36-year-old Jamaican record held by Don Quarrie by 0.11 s.
Mills complied with Bolt’s demand to run in the 100 m, and he was entered to run the event at the 23rd Vardinoyiannia meeting in Rethymno, Crete. In his debut tournament run, he set a personal best of 10.03 s, winning the gold medal and feeding his enthusiasm for the event. He built on this achievement at the 2007 World Championships in Osaka, Japan, winning a silver medal. Bolt recorded 19.91 s with a headwind of 0.8 m/s but this paled in comparison with Tyson Gay’s time of 19.76 s, which set a new championship record. The Jamaican national record fell when Bolt partnered with Asafa Powell, Marvin Anderson, and Nesta Carter in the 4×100 metres relay. However, their finish in 37.89 s was not enough to beat the Americans’ time of 37.78 s. Bolt did not win any gold medals at the major tournaments in 2007, but Mills felt that Bolt’s technique was much improved, pinpointing improvements in Bolt’s balance at the turns over 200 m and an increase in his stride frequency, giving him more driving power on the track. The silver medals from the 2007 Osaka World Championships boosted Bolt’s desire to run, and he took a more serious, more mature stance towards his career. Bolt continued to develop in the 100 m, and he entered to run in the event at the Jamaica Invitational in Kingston. On 3 May 2008, Bolt ran a time of 9.76 s, aided by a tail wind of 1.8 m/s, considerably improving upon his previous personal best of 10.03 s. This was the second-fastest legal performance in the history of the event; second only to compatriot Asafa Powell’s 9.74 s record set the previous year in Rieti, Italy. Rival Tyson Gay lauded the performance, praising Bolt’s form and technique especially. Michael Johnson, who was observing the race, said that he was shocked at how quickly he had improved over the 100 m distance. The Jamaican surprised even himself with the time, but coach Glen Mills remained confident that there was more to come. Mills’ prediction came true before the end of the month when Bolt established a new 100 m world record on 31 May 2008. Pushed on by a tail wind of 1.7 m/s, Bolt ran 9.72 s at the Reebok Grand Prix held in the Icahn Stadium in New York City, breaking Powell’s record. The record time was even more remarkable in light of the fact that it was only his fifth senior run over the distance. Gay again finished second and commended Bolt’s physical superiority, stating, “It looked like his knees were going past my face”. Commentators noted that Bolt appeared to have gained a psychological advantage over fellow Olympic contender Gay. In June 2008, Bolt responded to claims that he was a lazy athlete, saying that the comments were unjustified, and he trained hard to achieve his potential. However, he surmised that such comments stemmed from his lack of enthusiasm for the 400 metres event, and chose to not make the effort to train for distance running. Turning his efforts to the 200 m, Bolt proved that he could excel in multiple events—first setting the world-leading time in Ostrava, then breaking the national record for the second time with a 19.67 s finish in Athens, Greece. Although Mills still preferred that Bolt focus on the longer distances, the acceptance of Bolt’s demand to run in the 100 m worked for both sprinter and trainer. Bolt was more focused in practice, and a training schedule to boost his top speed and his stamina, in preparation for the Olympics, had improved both his 100 m and 200 m times. His confidence was building, and he was sure that he would perform well in the upcoming Olympics. Bolt held a considerable lead over his rivals in the closing stages of the 100 m final. Bolt announced that he would double-up with the 100 metres and 200 metres events at the Beijing Summer Olympics, and the new 100 m world-record holder was the favourite to win both. Michael Johnson, the 200 m and 400 m record holder, personally backed the sprinter, saying that he did not believe that a lack of experience would work against him. Bolt qualified for the final with times of 9.92 s and 9.85 s in the quarter-finals and semifinals, respectively. In the Olympic 100 m final, Bolt broke new ground, winning in 9.69 s (9.683 s more precisely, with a reaction time of 0.165 s). This was an improvement upon his own world record, and he was well ahead of second-place finisher Richard Thompson, who finished in 9.89 s. Not only was the record set without a favourable wind (+0.0 m/s), but also he visibly slowed down to celebrate before he finished and his shoelace was untied. Bolt’s coach reported that, based upon the speed of Bolt’s opening 60 m, he could have finished with a time of 9.52 s. After scientific analysis of Bolt’s run by the Institute of Theoretical Astrophysics at the University of Oslo, Hans Eriksen and his colleagues also predicted a sub 9.60 s time. Considering factors such as Bolt’s position, acceleration and velocity in comparison with second-place-finisher Thompson, the team estimated that Bolt could have finished in 9.55 s had he not slowed to celebrate before the finishing line. 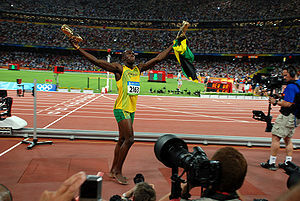 Bolt stated that setting a record was not a priority for him, and that his goal was just to win the gold medal, Jamaica’s first of the 2008 Games. Olympic medalist Kriss Akabusi construed Bolt’s chest slapping before the finish line as showboating, noting that the actions cost Bolt an even faster record time. IOC president Jacques Rogge also condemned the Jamaican’s actions as disrespectful. Bolt denied that this was the purpose of his celebration by saying, “I wasn’t bragging. When I saw I wasn’t covered, I was just happy”. Lamine Diack, president of the IAAF, supported Bolt and said that his celebration was appropriate given the circumstances of his victory. Jamaican government minister Edmund Bartlett also defended Bolt’s actions, stating, “We have to see it in the glory of their moment and give it to them. We have to allow the personality of youth to express itself”. Bolt then focused on attaining a gold medal in the 200 m event, aiming to emulate Carl Lewis’ double win in the 1984 Los Angeles Olympics. Michael Johnson felt that Bolt would easily win gold but believed that his own world record of 19.32 s set at the 1996 Summer Olympics in Atlanta would remain intact at the Olympics. Bolt eased through the first and second rounds of the 200 m, jogging towards the end of his run both times. He won his semifinal and progressed to the final as the favourite to win. Retired Jamaican sprinter Don Quarrie praised Bolt, saying he was confident that Johnson’s record could be beaten. The following day, at the final, he won Jamaica’s fourth gold of the Games, setting a new world and Olympic record of 19.30 s. Johnson’s record fell despite the fact that Bolt was impeded by a 0.9 m/s headwind. The feat made him the first sprinter since Quarrie to hold both 100 m and 200 m world records simultaneously and the first since the introduction of electronic timing. Furthermore, Bolt became the first sprinter to break both records at the same Olympics. Unlike in the 100 m final, Bolt sprinted hard all the way to the finishing line in the 200 m race, even dipping his chest to improve his time. Following the race, “Happy Birthday” was played over the stadium’s sound system as his 22nd birthday would begin at midnight. Two days later, Bolt ran as the third leg in the Jamaican 4×100 metres relay team, increasing his gold medal total to three. Along with team mates Nesta Carter, Michael Frater, and Asafa Powell, Bolt broke another world and Olympic record, their 37.10 s finish breaking the previous record by three tenths of a second. Powell, who anchored the team to the finishing line, lamented the loss of his 100 m record to Bolt but showed no animosity towards his Jamaican rival, stating that he was delighted to help him set his third world record. Following his victories, Bolt donated $50,000 to the children of the Sichuan province of China to help those harmed by the 2008 Sichuan earthquake. Bolt’s record-setting runs caused commentators not only to praise his achievements but also to speculate about his potential to become one of the most successful sprinters ever. Critics hailed his Olympic success as a new beginning for a sport that had long suffered through high-profile drug scandals. The previous six years had seen the BALCO scandal, Tim Montgomery and Justin Gatlin stripped of their 100 m world records, and Marion Jones returning three Olympic gold medals. All three sprinters were disqualified from athletics after drugs tests detected banned substances in their systems. Bolt’s record-breaking performances caused suspicion among some commentators, including Victor Conte, and the lack of an independent Caribbean anti-doping federation raised more concerns. The accusations of drug use were vehemently rejected by Glen Mills (Bolt’s coach) and Herb Elliott (the Jamaican athletics team doctor). Elliott, a member of the IAAF anti-doping commission, urged those concerned about the issue to “come down and see our programme, come down and see our testing, we have nothing to hide”. Mills had been equally ardent that Bolt was a clean athlete, declaring to the Jamaica Gleaner: “We will test any time, any day, any part of the body… doesn’t even like to take vitamins”. Bolt stated that he had been tested four times prior to the Olympics, and all had tested negative for banned substances. He also welcomed anti-doping authorities to test him to prove that he was clean, stating, “We work hard and we perform well and we know we’re clean”. The end of the 2008 athletics season saw Bolt compete in the ÅF Golden League, beginning in Weltklasse Zürich. Despite having the slowest start among his competitors in the 100 m race, he still crossed the finishing line in 9.83 s. Even though the time was slower than both his newly set world record and Asafa Powell’s track record, it was still among the top-fifteen 100 m finishes by any sprinter to that date. Bolt admitted that he was not running at full strength, suffering from a cold, but he had concentrated on both winning the race and finishing the season in good health. At the Super Grand Prix final in Lausanne, Bolt ran his second-fastest 200 m with a time of 19.63 s, equalling Xavier Carter’s track record. However, it was the 100 m final, featuring Asafa Powell, that drew the most interest. Powell had moved closer to Bolt’s world record after setting a new personal best of 9.72 s, reaffirming his status as Bolt’s main contender. Bolt’s final event of the season came three days later at the Golden League final in Brussels. This was the first 100 m race featuring both Bolt and Powell since the final in the Olympics. Both Jamaicans broke the track record, but Bolt came out on top with a time of 9.77 s, beating Powell by 0.06 s. Victory, however, did not come as smoothly as it had in Beijing. Bolt made the slowest start of the nine competitors and had to recover ground in cold conditions and against a 0.9 m/s headwind. Yet the results confirmed Jamaican dominance in the 100 m, with nine of the ten-fastest legal times in history being recorded by either Bolt or Powell. On his return to Jamaica, Bolt was honoured in a homecoming celebration and received an Order of Distinction in recognition of his achievements at the Olympics. He was selected as the IAAF Male Athlete of the year and won a Special Olympic Award for his performances. However, Bolt turned his attention to future events, suggesting that he could aim to break the 400 metres world record in 2010 as no major championships were scheduled that year. Bolt started the season competing over 400 metres in order to improve his speed, winning two races and registering 45.54 s in Kingston, and windy conditions gave him his first sub-10 second finish of the season in the 100 m in March. In late April Bolt suffered minor leg injuries in a car crash. However, he quickly recovered following minor surgery and (after cancelling a track meet in Jamaica) he stated that he was fit to compete in the 150 metres street race at the Manchester Great City Games. Bolt won the race in 14.35 s, the fastest time ever recorded for 150 m. Despite not being at full fitness, he took the 100 and 200 m titles at the Jamaican national championships, with runs of 9.86 s and 20.25 s respectively. This meant he had qualified for both events at the 2009 World Championships. Rival Tyson Gay suggested that Bolt’s 100 m record was within his grasp, but Bolt dismissed the claim and instead noted that he was more interested in Asafa Powell’s return from injury. Bolt defied unfavourable conditions at the Athletissima meet in July, running 19.59 seconds into a 0.9 m/s headwind and rain, to record the fourth fastest time ever over 200 m, one hundredth off Gay’s best time. At the 2009 World Championships in August, Bolt eased through the 100 m heats, clocking the fastest ever pre-final performance of 9.89 seconds. The final was the first time Bolt and Gay had met in the season, and Bolt improved his world record with a time of 9.58 s to win his first World Championship gold medal. Gay finished with a time of 9.71 s, 0.02 s off Bolt’s 9.69 s world-record run in Beijing. Taking over a tenth of a second off the previous best mark, this was the largest ever margin of improvement in the 100 m world record since the beginning of electronic timing. Although Gay withdrew from the second race of the competition, the Jamaican once again produced world record-breaking form in the 200 metres final. He broke his own record by 0.11 seconds, finishing with a time of 19.19 seconds. He won the 200 m race by the biggest margin in World Championships history, even though the race had three other athletes running under 19.90 seconds, the greatest number ever in the event. Bolt’s pace impressed even the more experienced of his competitors; third-placed Wallace Spearmon complimented his speed, and former Olympic champion Shawn Crawford said “Just coming out there…I felt like I was in a video game, that guy was moving – fast”. Bolt pointed out that an important factor in his performance at the World Championships was his improved start to the races: his reaction times in the 100 m (0.146) and 200 m (0.133) were significantly faster than those he had produced in his world record runs at the Beijing Olympics. However, he, together with other members of Jamaican 4×100 m relay team, fell short of their own world record of 37.10 s set at 2008 Summer Olympics by timing 37.31 s, which is, however, a championship record and the second fastest time in history at that date. On the last day of the Berlin Championships, the mayor of Berlin presented Bolt with a 12-foot high section of the Berlin Wall in a small ceremony, saying Bolt had shown that “one can tear down walls that had been considered as insurmountable.” The nearly three-ton segment will be delivered to Bolt’s training camp in Jamaica. Several days after Bolt broke the world records in 100 and 200 meters events, Mike Powell, the world record holder in long jump (8.95 meters set in 1991) argued that Bolt could become the first man to jump over 9 meters, the long jump event being “a perfect fit for his speed and height”. Within a week of the end of the World Championships, Bolt declared that he is indeed interested in competing in the long jump discipline also. Bolt expresses a love for dancing and his character is frequently described as laid-back and relaxed. He is currently dating Mizicann Evans: the pair first became friends at a track meet aged 13, and became a couple in 2004. Bolt’s Jamaican track and field idols include Herb McKenley and former Jamaican 200 m record holder Don Quarrie. Michael Johnson, the former 200 m world and Olympic record holder, is also held in high esteem by Bolt. The first sport to interest him was cricket and he said if he was not a sprinter he would be a fast bowler instead. As a child he was a supporter of Pakistan and admired the bowling of Waqar Younis. He is also a fan of Indian batsman Sachin Tendulkar, West Indian opener Chris Gayle and Australian opener Matthew Hayden. Bolt has also expressed his love for football and is a fan of Manchester United. Following a race in Manchester, he met the team at their training ground and offered Portuguese national Cristiano Ronaldo some sprinting advice. After winning the 200 m title in the 2002 World Junior Championships in Kingston, Jamaica, Bolt signed a sponsorship deal with Puma. To promote Bolt’s chase for Olympic glory in the 2008 Summer Olympics in Beijing, China, Puma released a series of videos including Bolt’s then-world-record-setting run in Icahn Stadium and his Olympic preparations. After his world record breaking run in New York City, which was preceded by a lightning storm, the press frequently made puns on the Jamaican’s name, nicknaming him “Lightning Bolt” and the “Bolt from the blue”. During the Beijing 2008 100 m final, Bolt wore golden Puma Complete Theseus spikes that had “Beijing 100 m Gold” emblazoned across them. His athletics agent is PACE Sports Management. 100 metres 9.58 Berlin, Germany 16 August 2009 Also holds the second fastest time with 9.69, which is the Olympic record. 150 metres 14.35 Manchester, United Kingdom 17 May 2009 World best He ran the last 100 m in 8.70, the fastest ever recorded time over a 100 m distance. 200 metres 19.19 Berlin, Germany 20 August 2009 Also holds the second fastest time with 19.30, which is the Olympic Record. 4 x 100 metres relay 37.10 Beijing, China 22 August 2008 Shared with Asafa Powell, Michael Frater and Nesta Carter. Also holds the second fastest time with 37.31. Bolt’s personal best of 9.58 seconds in the 100 metres is the fastest ever legal time. Bolt also holds the second fastest time of 9.69 seconds (more precisely 9.683), the current Olympic record. Tyson Gay recorded a time of 9.68 s at the 2008 US Olympic Trials, but was aided with a tail wind of 4.1 m/s, exceeding the legal limit of 2.0 m/s set by the IAAF and nullifying its inclusion as a world record. Obadele Thompson’s run of 9.69 s in 1996 is also not recognised as it was aided by a 5.0 m/s tail wind. The Jamaican relay team including Bolt, set the 4×100 metres world and Olympic records at the 2008 Olympics with a time of 37.10 seconds. This is the only run in the IAAF top ten performances which was not set by an American team.